We recently conducted a UK-wide survey to find out more about the nation’s spring cleaning habits. The research provided lots of interesting insight, including the most common excuses offered by those who avoid spring cleaning at all costs, and the most popular and unpopular household chores. One thing we found particularly alarming was that cleaning the gutters and unblocking drains were among the household chores least likely to be included in an annual spring clean. The team here at UKDN Waterflow (LG) is dedicated to ensuring drains and gutters across the UK are in the best shape possible, because we see first-hand the consequences of neglecting them. That’s why we thought we’d offer some practical tips for keeping your drainage system spick and span. One of the most common problems encountered by those who don’t take good care of their drainage systems is unpleasant odours making their way into the home. 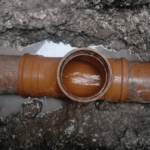 This is usually caused by a blockage in the drain leading to a buildup of stagnant water, or pungent, excess air in the drainage system rising up through your pipes. This foul-smelling excess air is often referred to as ‘sewer gas’ and, in addition to smelling bad, it has the potential to cause explosions because it is made up of significant amounts of the explosive and flammable chemical compounds methane and hydrogen sulfide. Unfortunately, you are much more likely to get an infestation of unwanted visitors if your drains are broken and/or full of food that you emptied down the sink. Both are caused by neglecting the health of your drainage systems. So, it’s simple; if you don’t want rats in your home, follow our advice! Blockages in sewage systems are, unsurprisingly, a major cause of flooding within the home. Not only can this lead to structural damage to your property, it can also mean having to move out while the damage is being repaired. There is also the prospect of having to claim on insurance. Blocked gutters, overflowing pipes and leaky plumbing are common causes of penetrating damp, which can lead to anything from blotchy patches of damp on walls and crumbling plaster to full-on puddles forming in your home. Do you have any top tips on how to keep your gutters and drains clean? Let us know via Twitter – tweet to us @UKDNWaterflowLG.